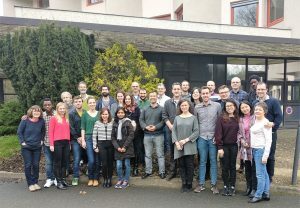 From 22nd to 26th January, a five-day workshop was organised for all ESRs by France BioImaging Ile de France Sud (BioEmergences and I2BC Imagerie Gif), Unitwin UNESCO CS-DC and STUBA Bratislava under the supervision of Nadine Peyrieras (CNRS-Partner 3) and her colleagues. The workshop dealt with imaging strategies, image processing, data management and data interactive visualisation and analysis. Training session on Ethics & Responsibility in Science & Gender issues was given to ESRs (and to the large public) by Prof. Susanne Foitzik (University of Mainz) on 29th January 2018. Many cases of scientific misconduct were discussed and the workshop ended by an interesting debate between students and experienced researchers. The review meeting took place from 29th to 31st January and was devoted to the administrative, organisational and financial issues of the project and to the scientific review of ESRs’ research projects. Each ESR presented his/her project individually and these presentations were followed by fruitful discussions with other ESRs and PIs. It was great to meet and get know better our ESRs coming from all over the world. ImageInLife consortium is thus complete and scientific collaborations can start now!